Let’s quickly go through what you can do with the Gimp. The painting function has the essential clone, airbrush or pencil tools and a powerful gradient and blend tool. You can also create and save your own brushes and patterns for later use. The program lets you manipulate your photos, adding layers, doing Bezier and polygonal selections or setting text. Load and save animations in a frame-as-layer format and batch process all your photos for quick editing. The multi-windowed interface can be moved around to fit your needs and resized according to your desktop space. Despite this fairly hazardous installation process, the Gimp is a program we recommend. 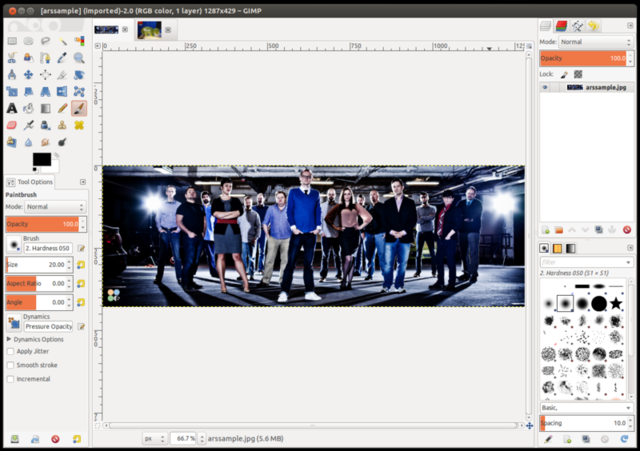 Whether you’re out of dough or are looking for a free alternative to Photoshop, the Gimp is excellent image manipulation software with all the tools you’d expect. The friendly interface and expandability make this a program of choice. · Advanced path tool doing bezier and polygonal selections. · Transformable paths, transformable selections. · Quickmask to paint a selection.